The conveners, Jim Evans (Utah State), Teng-fong Wong (Stony Brook) and Ben van der Pluijm (Michigan), in consultation with co-Principal Investigators Steve Hickman, Mark Zoback and Bill Ellsworth, hold a mini-workshop that focuses on the study of cuttings and cores collected during drilling of the San Andreas Fault Observatory at Depth (SAFOD). Drilling of the San Andreas Fault has started this summer (see http://www.icdp-online.de/sites/sanandreas/index/index.html ) and will recover geologic samples that offer unrivaled opportunity to study seismogenic fault rocks and fault mechanics, and relate fault processes to seismic processes. This workshop will help coordinate research efforts of various groups, identify any gaps in our characterization studies, and begin to develop strategies for integrating the rock characterization efforts with other results from SAFOD, including fluid and gas measurements, borehole geophysical measurements, seismic monitoring, and in-situ stress measurements. 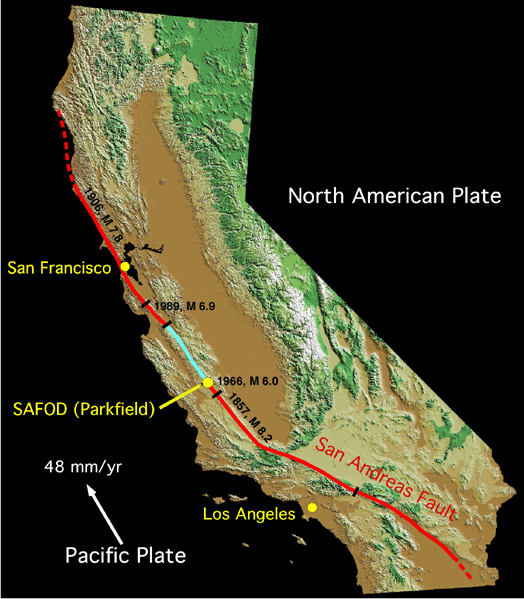 The scientific objective of the San Andreas Fault Observatory at Depth (SAFOD) is to directly study the physical and chemical processes that control deformation and earthquake generation within an active plate-bounding fault zone. The SAFOD drill site is located on a segment of the San Andreas Fault that moves through both aseismic creep and repeating microearthquakes. It lies at the northern end of the rupture zone of the 1966, Magnitude 6 Parkfield earthquake, which is the most recent in a series of events that have ruptured the fault five times since 1857 (see Figure for setting). (from EarthScope Facility Proposal; http://www.earthscope.org/assets/es_parts_I-IV_lo_1.25.pdf ). What are the mineralogy, deformation mechanisms, and constitutive properties of the fault gouge? Why does the fault creep? What are the strength and frictional properties of recovered fault rocks at realistic in-situ conditions of stress, fluid pressure, temperature, strain rate, and pore fluid chemistry? What determines the depth of the shallow seismic to aseismic transition? What is the nature and extent of chemical water-rock interaction and how does this effect fault zone rheology? What are the composition and origin of fault-zone fluids and gasses? Is fluid chemistry relatively homogeneous, indicating pervasive fluid flow and mixing, or heterogeneous, indicating channelized flow and/or fluid compartmentalization? What are the physical properties of fault zone materials and country rock (seismic velocities, electrical resistivity, density, porosity)? 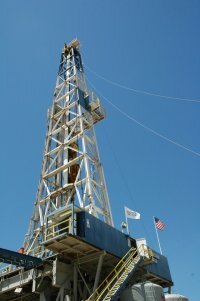 How do physical properties from core samples and downhole measurements compare with properties inferred from surface geophysical observations? The proposed SAFOD workshop will bring together active researchers from a variety of fields who have committed to work on or have expressed an interest in the study of San Andreas Fault rock. Given overlapping interests and approaches, it is critical to coordinate a research approach that complements individuals’ activities and avoids unnecessary duplication. The workshop size is intentionally small as this creates an optimal environment for discussion and planning. The group will meet as a whole on day one and in small break-out groups during the morning of day two to formulate research activities. The entire group will reconvene at the afternoon session of day two to discuss and summarize outcomes of prior sessions. A report from the workshop will be produced by the conveners for planned publication in GSAToday and EOS, as well as presentation at SAFOD-oriented sessions at meetings. This planning workshop will foster communication among researchers who will examine rock core and cuttings from the SAFOD project. Particularly, the workshop will enable us to identify and eliminate any potential overlaps or gaps in the proposed work. We will also discuss the work in light of the other related SAFOD research, to begin to place the geological, mineralogical and geochemical results in the broader context of the SAFOD effort. This workshop will begin our efforts to maximize the impact of the characterization and interpretation of rock samples from the San Andres Fault, and provide avenues for workers to determine how our results can be interpreted in the geomechanical, geophysical and seismological contexts of the project. The workshop will be held on October 8 and 9, 2004 (Fri and Sat) at the Marriott Courtyard San Jose Airport (http://marriott.com/property/propertyPage/SJCCA ). You are asked to arrive at the hotel sometime on Thursday October 7, after ~3pm (earliest hotel check-in time). 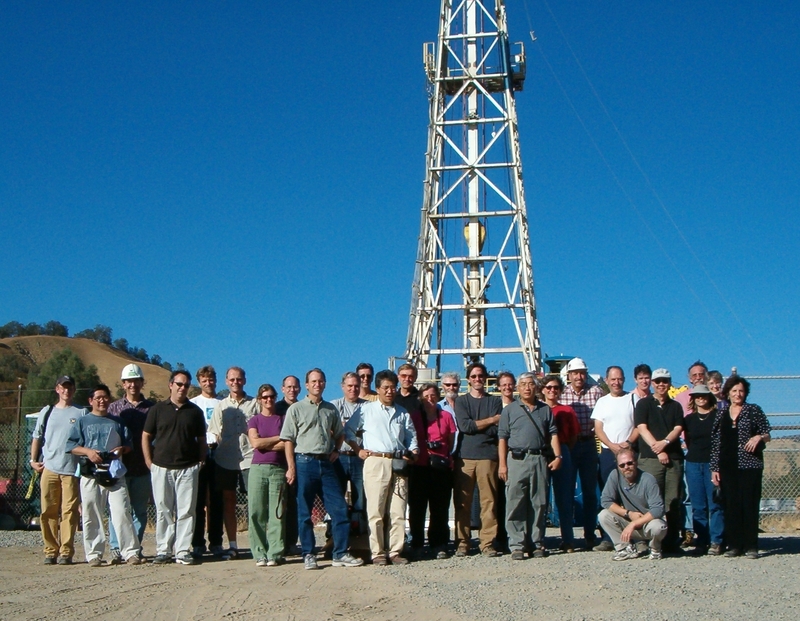 The first workshop day (Friday) will include general presentations and a visit to the SAFOD drill site (large coach). On the second day (Saturday) we will meet in the hotel in plenary and break-out sessions. Depart on Sunday October 10 (from SJ Airport), with 1pm hotel check-out time. We received funding from the National Science Foundation’s EarthScope Program (Kaye Shedlock) that will support all participants’ cost upon arrival at the workshop venue (and drill site trip) and offers partial airfare support to/from San Jose, CA. The three conveners are reached by emailing to SAFODsamplesworkshop04@umich.edu. The November 2004 report to the NSF on the "SAFOD: 2004 sample analysis workshop" is available here. Latest update, Tuesday, November 30, 2004 17:41.